He has the most perfect eyebrows! When people gaze upon me, let’s just say that they do not automatically launch into speeches about how excellent my eyebrows are. I have many early memories of my mother combing them into place, or licking her finger and then smoothing them into place before we went into church, or school, or shopping. They would not be conquered. And then, when I was in college, a friend from high school came to visit me on campus and broke my heart by saying. “I want to grab your eyebrows. They are just like Mark Twain’s!” Perhaps an astute comment, but not what a 19 year old co-ed is looking to hear. I like to think that she was trying to be friendly, with sort of a literary twist. But obviously, I wouldn’t be dredging it up 19 years later if it hadn’t sort of upset me. I identified two characteristics of good eyebrows above, and will revisit them here and apply them to my own eyebrows. 1. Contrast: There is a contrast between my eyebrows and my face, but it’s the sort achieved with night vision goggles. My face is somewhat exuberant in the color department, my eyebrows are glinty blonde, and can sometimes appear to be glowing a spectral green. When I’m dressing up, I color them in with a brown pencil. 2. Form: Yellow hair traditionally implies delicateness, right? RIGHT? Surely you have read Fairy Tales. Well, ok. Don’t be fooled. Like the hair on my head, the hairs of my eyebrows are sproingy and individualistic and they grow very very fast. Earthlings do not favor curly eyebrows. Maybe a desire to curl is the problem. So, let’s try having less. For a while, I got my eyebrows waxed. Then once, someone tore the skin near my eye by tearing hot wax off of it. No thanks! I’ve resorted to threading. I wish I could explain it to you, but it is far too mysterious. I have looked on the Internet, and I can report with confidence that it’s a mode of hair removal popular in India and in the Middle East. Not to imply anything about those places, but it’s a wholly barbaric, if effective, practice. I cannot even communicate with the woman who I pay to do it well enough that I can know where she is from, but I feel afraid of her, perhaps because of her highly judgmental, beauty professional status. I arrive, she points to a chair, gestures that I should slump down, tears a piece of thread and keeps one end of it between her teeth, and goes to work in a fast and systematic motion of twirling thread around my eyebrow hairs to tear them out. First it doesn’t hurt too badly: the hairs are teensy and she’s just warming up. Then my ears start to fill with an unusual roaring noise. Sort of like the kind of noise that happens when you are yawning, except I’m not yawning, I’m getting the individual hairs of my eyebrows torn out in public, pop pop pop pop pop, by some highly authoritative woman who won’t talk with me, who is keeping her torture device between her teeth. By this point in the procedure I can’t hear, and now tears are spilling down over my cheeks. I have to beg her for a moment of respite. I wipe my eyes away. I imagine that she thinks I am an English-speaking wimp who doesn’t tolerate pain very well. But I do! I want to say. I went to a hospital once and they said that I do tolerate pain well! . . . You respect me, right? Instead I slump down again and wait for her to resume. During the next break 30 seconds later I try to ask her, cheerfully, if her if her eyes water when she gets her eyebrows threaded. She stares at me. She is totally silent. When I am done, she tells me, “Six dollars.” My goodness. In an effort to get her to like me, or perhaps in an effort to get me to like me, and I leave twice what she asks: a 100% tip. She continues to never smile at me, ever at all. First, I made sure she couldn’t see my non-seasonally themed nails. Then, I tried to think up some sort of response, or at least acknowledgment, of this ballsy estimation. Since my sister can’t talk anymore, and my son can’t talk yet, it was up to me to say something. At a loss, I decided to try to laugh it off. She continued on by continuing to address Henry. “Well, what can I say, it’s true. Your eyebrows much, much nicer than your mama’s.” Poor Henry of the perfect eyebrows, who barely speaks English unless you are talking about bananas or going on a walk, already implicated in this crap. Something had to be done, so earlier today forced myself to revisit the Silent Threader. Things over there are pretty much status quo, but at least I look a little bit tamer for the next week or so. Thanks to Mercedes . . . Life As I Pictured on Flickr for use of the photo. wow. you are brave. 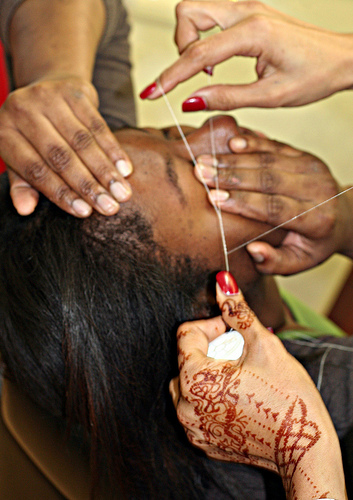 i’ve always wondered about threading and if anyone really did it! i don’t have the pain threshhold for any kind of hair removal. great post! I’ve been wanting to try threading and even booked a haircut at a new place just because I wanted them to thread my eyebrows too. But the hair stylist had another solution, which was to give me a tousled razor cut hairstyle to match my messy brows. What’s funny to me is that I think your son has your eyebrows. Also maybe she would be less scary if you started calling her Silent but Threadly. There is a threading place in Paris. Or, rather, there is a place in Paris that perhaps is for things like nails and hair or maybe caulking and laying tile, where also, according to the marquee, you can get your eyebrows threaded. I always pictured a kind of eyebrow weave. And I always wondered why anyone would want extensions for their eyebrows, but now I know what it actually is, and I wonder, why would anyone want their eyebrows threaded? Also, to the list of reasons why she might hate you, I will add your over dependence on the number 2.